I want to create a scene that has a lot of irregularly shaped objects piled up on the ground. I don't want the objects to intersect with eachother. 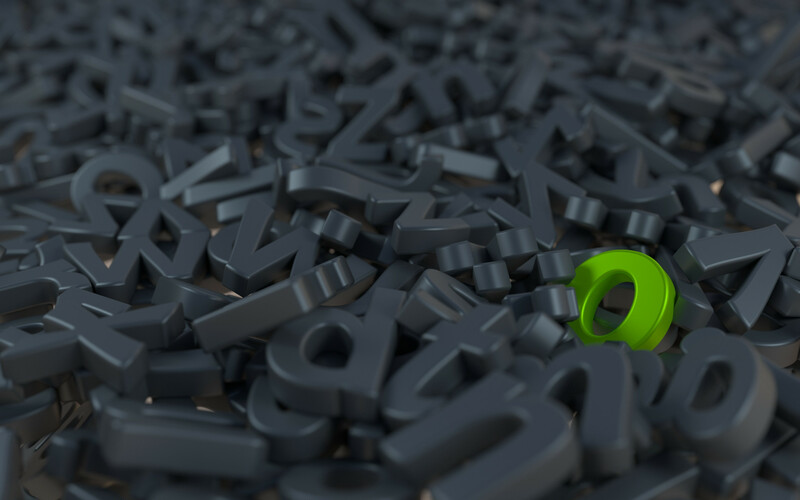 I started off by creating a particle system that uses an object group containing these objects. No matter what settings I 'messed with' I could not get the individual objects to behave the way I want them to - They would interact with the ground like perfect spheres, and they would pass through the other particle objects. Is there a way to make particles have rigid body physics so they behave with each other and with the ground like real objects? 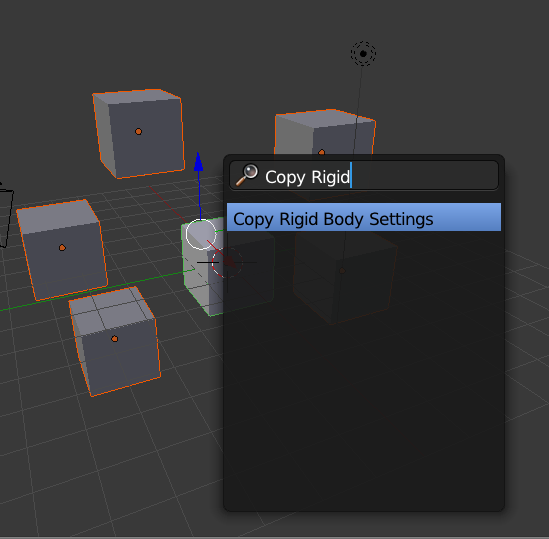 [Is] there a way to copy rigid body attributes to many objects? Copy Rigid Body Settings sounds like it might do the trick. Select all the objects, then select the one with the correct settings last (make it the active object). 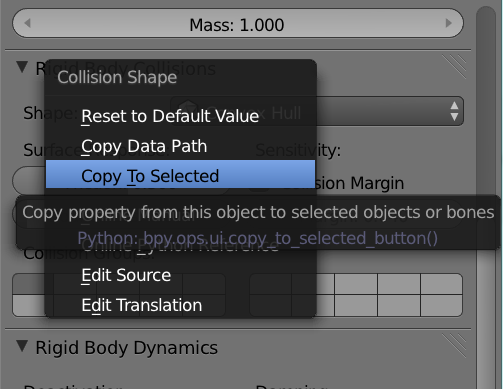 Then, press Space> Copy Rigid Body Settings, or select Copy from Others from the Object Mode toolbox under Rigid Body Tools. To do it natively: if there is a way, I can't find it. I've tried Particle Instance modifier with rigid body instances, Size Deflect option, duplication, hooks… nada. Do post if you find a “cleaner” way to do it. Do what you were doing and when the particle system has spawned enough objects stop the animation and use ShiftCtrl + A which is Make Duplicates Real. Now do what WChargin said in his answer. I was seeking for the same topic and I found a solution better than the "Make Duplicates Real". I noted if the tools 't' physics tab is visible You'll see Rigid Body Tools where a "Copy to Active" button exists. If the Particles modifier has been applied to make the objects real. I tried this RMB thing on a single value (which is not the goal) and it's grayed out because the selected objects do not have the Rigid Body Collisions applied yet. I don't think this has the right option https://wiki.blender.org/index.php/Extensions:2.6/Py/Scripts/3D_interaction/Copy_Attributes_Menu which is it? And nor does CTRL-L the one with 'object data' didn't do it so I'm thinking it lacks a Link Physics choice there too. So they both lack a copy physics attribute it seems. Not the answer you're looking for? Browse other questions tagged physics particles rigid-body-simulation or ask your own question. How do I prevent particle objects from intersecting each other and going though the floor? How to break a voxelated object into voxels? How to drop particles so they land in a natural way? How to make small objects fall properly with rigid body? How do you stop the sliding of rigid body objects? Link or quickly copy rigid body constraint settings?